If three dinosaurs roar when you open your door, what do you say? "Boo!" of course! 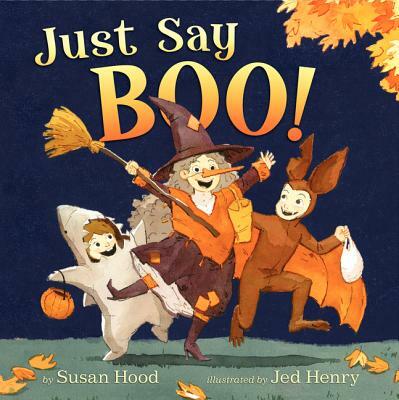 In this charmingly spooky story by Susan Hood, little trick-or-treaters learn just what to say in every Halloween situation. From rattling bones to ghostly footsteps, Susan captures all the best scares of the season—and teaches just the right way to dispel fears in favor of fun. Jed Henry's lustrous watercolors add the perfect crisp chill to this fall-weather story. For if a skeleton groans as she rattles her bones, what do you say? Jed Henry is an animator and artist. He has previously illustrated Pick a Pup by Marsha Wilson Chall and Can't Wait Till Christmas by Mike Huckabee. He lives in Provo, Utah, with his wife and daughter.